(NaturalSociety.com)What would you say if 10 of the top 26 pharmaceutical companies had been telling you bold faced lies about the drugs they sell you? Would you be upset? Irritated? Maybe on a good day, bemused? According to 2 papers published by one of the most prestigious medical journals – The New England Journal of Medicine – even seemingly-astronomical fines aren’t keeping Big Pharma honest. In just the past several years, this industry has been fined more than $11 billion dollars for putting people’s health in serious detriment – but to no avail. A leopard really doesn’t change its spots. When GlaxoSmithKline was fined $2 billion, do you think it made them change their ways? They kept right on bribing doctors and their families with VIP tickets to see Madonna in concert or fully-paid vacations to tropical getaways like Hawaii in order to get them to prescribe their drugs. Prosecutors said ‘safety took a backseat to profit.’ However, is a measly $2 billion really much more than a slap on the wrist to a company who enjoys billions in sales annually, with profits that have more than tripled in just the past three years? Furthermore, drugs are being promoted for use, for far more than what they are legally licensed. Drug companies are also known to withhold data which shows that drugs are unsafe or questionable in order to gain FDA approval. Some companies will go so far as to fake thousands of documents – not caring that they are putting people’s health in serious question all the while. 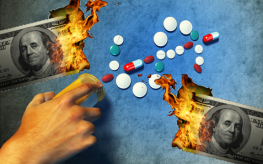 The lies of Big Pharma have eroded public trust and made a mockery of the FDA. Even specialist lawyers warn that multi-billion dollar fines are not adequate to change the industry’s behavior. Their pockets are too big, and the possible gains of promoting and new drug are too great. They just take these little monetary nuisances in stride. Until Big Pharma stops handing out damaging drugs like Halloween sweets, we need to stop buying them, and doctors need to stop prescribing them. I challenge doctors to tell their patients the truth about disease and how it is caused. Drugs will not cure social ills, unemployment, poor housing, soiled water, and defunct soil. Germans call the state of the world ‘status kranken’ which means sick state. It is Big Pharma who is really sick, not the people of the world. Perhaps some jail time, after all, they are dealng w/people’s lives here, they should be held accountable for their actions and their products, especially since they’re in such a damn hurry to flood the market with it in the first place. Mockery of the FDA – that is a funny statement. The FDA has been a pharma prostitute for decades. If there were truly “justice” in this country. . The CEO’s and various board members would be held liable for the drugs they sell. .Particularly after knowingly selling toxic drugs. . They should be tried, and if found guilty sentenced to the same prison other “murderers” are placed. . Of course we all know this would never happen, but it would be justice served. . In general what we need to do is rethink the freedom from liability that comes with the corporate structure. If these parasites were looking at potential jail time, I suspect they would behave a bit better.